Enjoy this one-pot dish made with fresh yakisoba noodles and a lot of vegetables. I’ve been making this dish for years and had so many people turned on to this dish. The curry and tamari soy sauce flavors make a great combination. The noodles become nicely spicy and robust. This is a completely vegan dish with layers of flavors and textures. The sauce and sun-dried tomatoes bring out the rich umami, too. 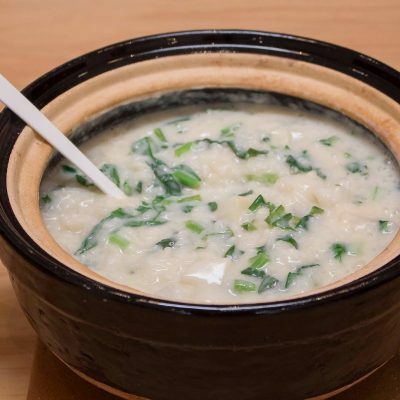 I eat a lot of porridge especially in the winter time, as the dish is not only so gentle to your stomach, but is also a great way to keep your body warm. 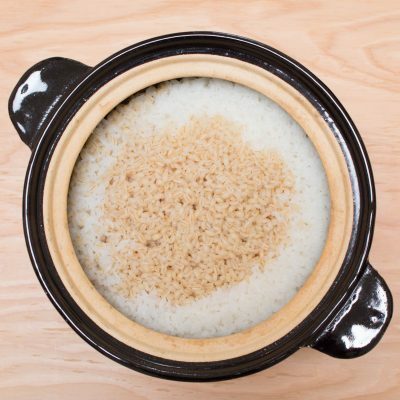 In Japanese tradition, on January 7, we eat Nanakusa-gayu (7-herb rice porridge), and it’s a custom to to bring health and longevity. It also has a meaning to clean your body with this simple porridge after consecutive days of feast during the New Year holidays. Outside of Japan, including Los Angeles where I live, it’s not easy to source all the 7 kinds of Japanese herbs locally, so I actually enjoy making my own version with just kabu (Japanese turnips; its’ leaves are one of 7 herbs in Nanakusa-gayu) and use pure soymilk, in addition to kombu infused water, to cook the rice. It’s rich, creamy, really flavorful, and still light in your stomach. 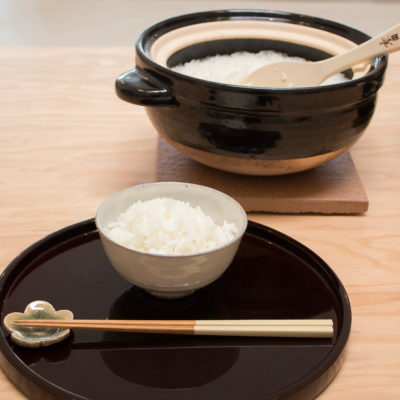 It’s totally fine to cook it only with water (for more plain version), or use your choice of dashi such as kombu and bonito dashi for slightly deeper flavor. And, you can enjoy with your choice of condiments. 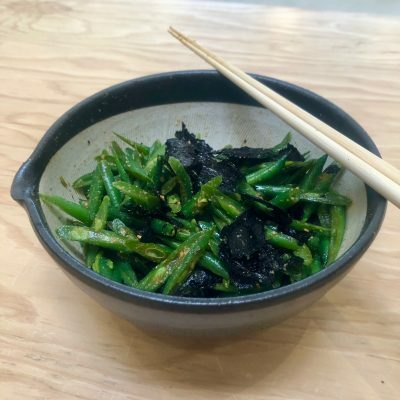 This quick salad dish is very easy to make, and I love how the nori brings a beautiful aroma to this dish. 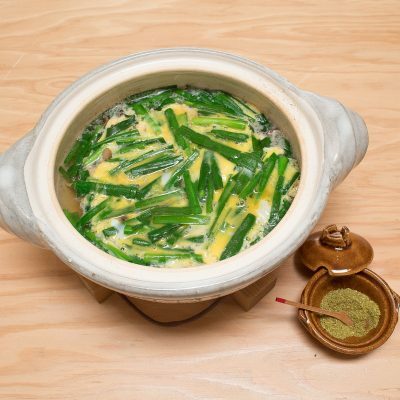 The roasted and ground sesame seeds, yuzu juice, and sesame oil adds extra layers of flavor, and go well with the tender green beans steamed in Mushi Nabe. You can substitute the golden sesame seeds/ golden sesame oil with black sesame seeds/ black sesame oil for a variation. 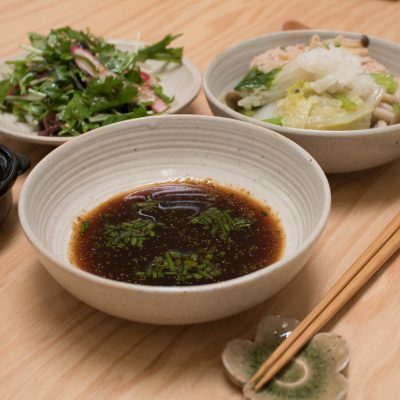 The tamari soy sauce not only gives the rich umami to the dish, but makes the dish friendly for those on a gluten-free diet. 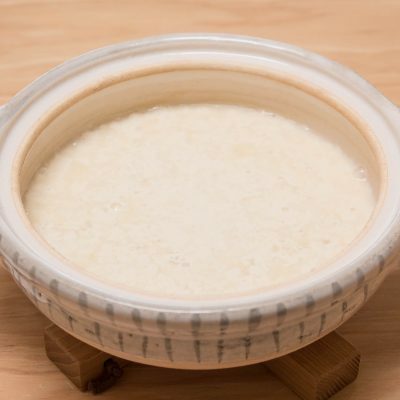 Authentic fresh tofu can be made at home very easily, once you have a donabe and high quality soymilk. All you need to do is to heat soymilk, stir in nigari liquid, turn off the heat, and rest until the mixture sets to become tofu. 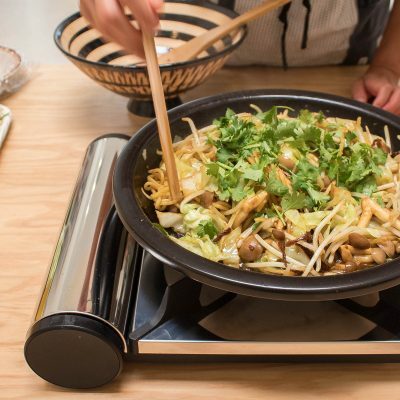 Iga-yaki donabe is perfect for fresh tofu making, because the porous body achieves the gentle and even heat distribution. It also cools down very slowly after turning off the heat, so the tofu can set to ideal stage during the resting time. The fresh warm tofu right out of donabe is simply a joy and I always have my first few tastes without any seasonings or condiments. It’s so fluffy, delicate, and pure. Then, I enjoy it with different toppings. Sometimes simply with shaved katsuobushi (shaved dried bonito flakes) and soy sauce, or wasabi, sea salt (such as moshio sea salt), and sesame oil. Ponzu is great, too. Premium quality Banrai Soymilk and Banrai Nigari Liquid are both available at our shop. So, hope you give it a try. 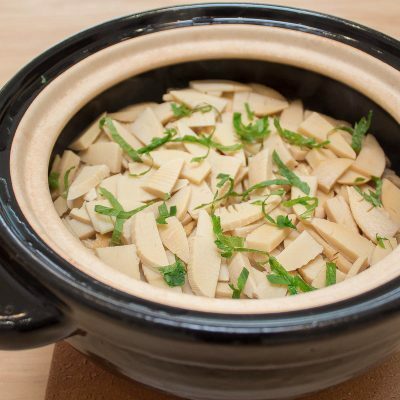 You can make a full-size sukui tofu to share or a small individual-size tofu in a mini-size donabe for everyday breakfast. The recipe introduced in this page is calling for 1-liter soymilk. 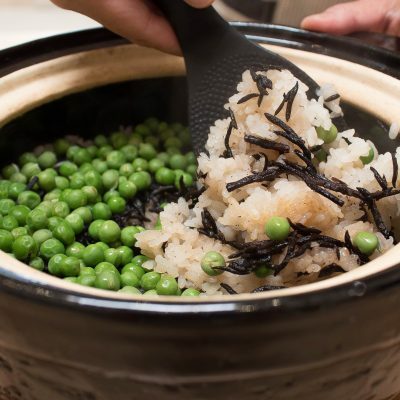 For the half amount, you can use a small-size classic-style donabe (approx. 0.8-qt/ 800 ml size). The photos below are made with small-size Rikyu-Tokusa donabe. For an idividual-size silky tofu making method, please see Banrai Soymilk and Banrai Nigari Liquid product page. Combination of soy sauce, daidai citrus and sansho powder (did you know sansho also belongs to citrus family?) create such refreshing bright aroma and kick in this quick dipping sauce. Adjust the amount of sansho powder according to your taste (or tolerance to its numbing heat). 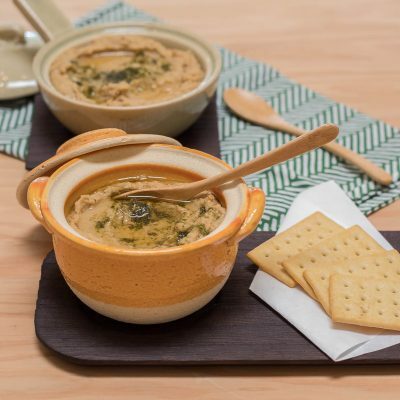 Originally introduced to serve with Shiso Chicken Meatball and Grated Daikon Hot Pot, this sauce is good for any hot pot dishes, or as a dipping sauce for gyoza dumplings. This vegan treat is so easy to make and very satisfying. 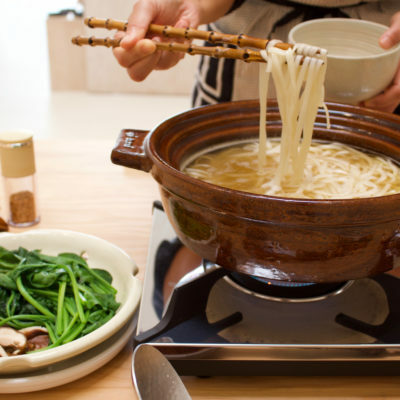 You just prepare the dashi broth for the udon in the bottom bowl of the Mushi Nabe, set the steam grate on top to steam the vegetables first. Once the vegetables are ready, remove the grate and cook the udon in the broth. 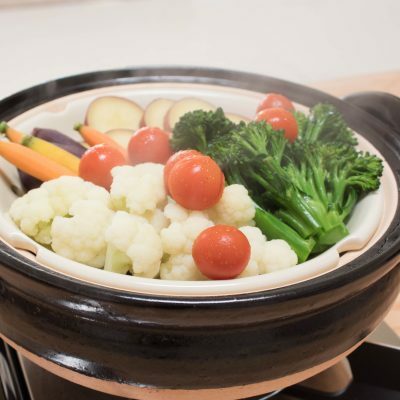 Because the vegetables are steamed, they tend to retain more nutrients and taste very pure. 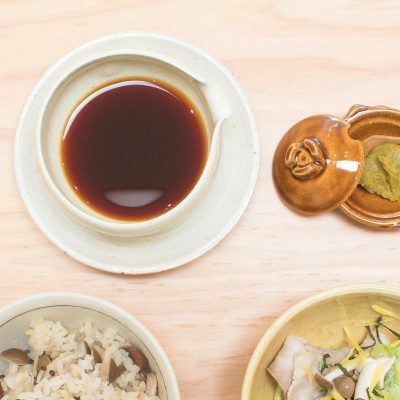 The ginger-scented broth stays also very clear and the flavor is so rich in kombu‘s umami. So, this is a win win dish. 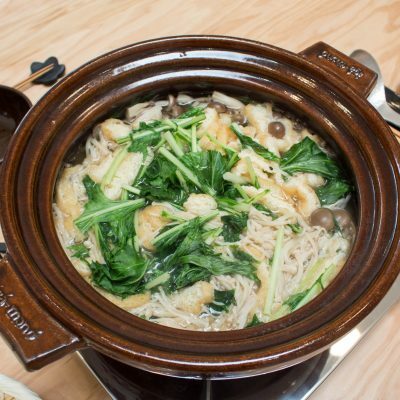 In this recipe, I used Bistro Mushi Nabe, but you can make this dish with any donabe which is equipped with a steam grate. Adjust the recipe amount according to your size of donabe. 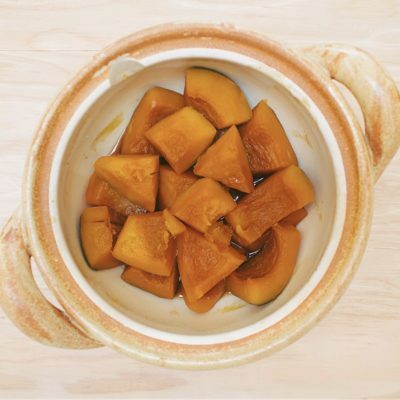 This is a classic Japanese home-style dish, and we love the full flavor of nutty kabocha with light seasoning of soy sauce, etc. This dish is almost ridiculously easy to make. Once you arrange the cut kabocha pieces with seasonings in a donabe, you heat it and let the donabe do the work for you. You don’t even need to stir the contents. With Miso-shiru Nabe, the delicate kabocha can cook so tender without falling apart. 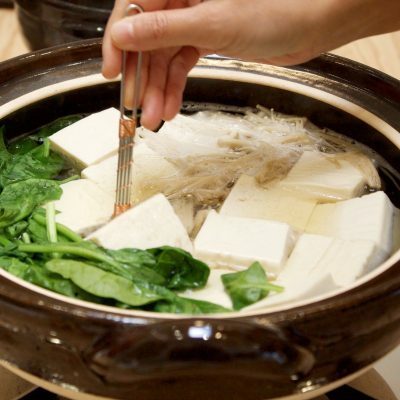 Yu-Dofu (tofu hot pot) is a very simple and popular home dish in Japan. 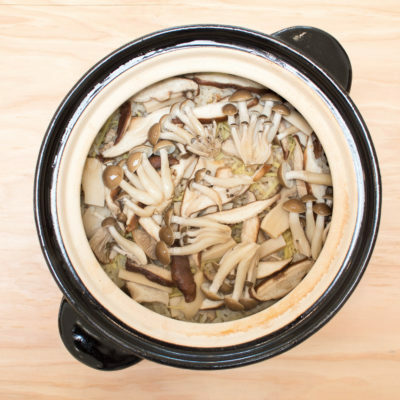 This version has addition of spinach and enoki mushrooms to boost nutrients and flavors. Yu-Dofu‘s best accompaniment is ponzu, and my quick daidai citrus ponzu tastes so refreshing and aromatic. Then, you can top the tofu with a generous amount of freshly-ground toasted sesame seeds in suribachi and surikogi (Japanese mortar and pestle), which is so nutty and aromatic. 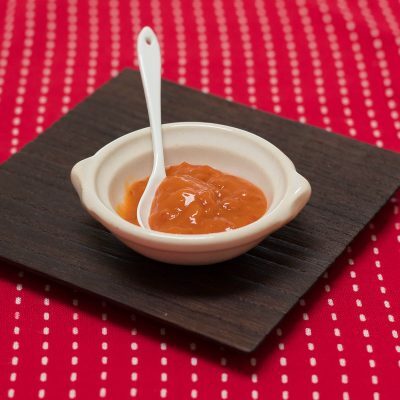 Kanzuri (chili condiment from Niigata, Japan) is another great condiment. Here’s another variation of my recipe using slow-roasted tomatoes. 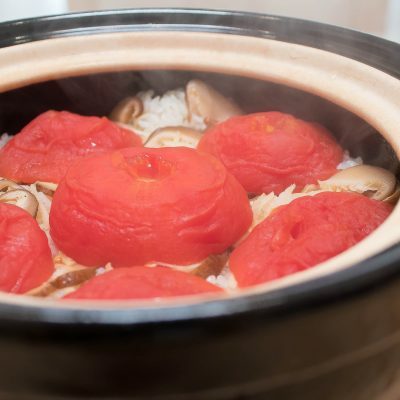 After 4 – 5 hours in the oven, the tomatoes become so rich in umami flavors and very soft. 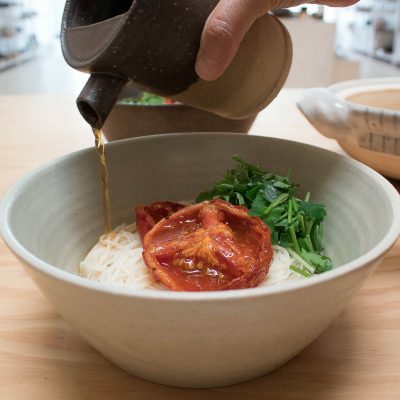 So, I like to serve it very simply by topping them over the cold somen noodles and pouring a soy-flavored dashi broth over it. I like breaking the tomatoes with chopsticks and gently mix with the noodles as I eat, or you can coarsely chop the tomatoes before topping over the noodles, too. The best thing is that both the tomatoes and broth can be prepared up to a few days in advance. So, once I make them for the next days, all I need to do is just boil the somen noodles and assemble them for a quick delicious meal. 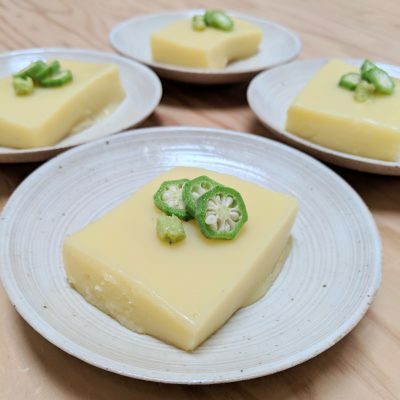 Just mix equal parts of the hot and umami-rich Kanzuri and Yuzu Juice, and it becomes a perfect aromatic condiment with a kick. I like it with any rice dish (like my Corn Rice), noodle, or grilled meat (great with yakitori, too). 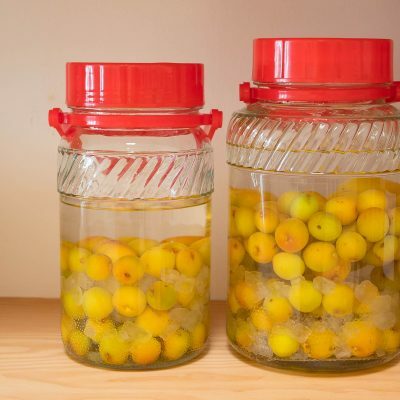 Ume-shu is a traditional Japanese plum liqueur and one of the most popular alcoholic drinks to make at home in Japan. My late mother used to make a few large batches when plums were in season (May – June) every year, and now I’m taking over the tradition in my home in LA. She used to sip it o the rocks after dinner (or sometimes before dinner). I like it on the rocks or sometimes enjoy it mixed with sparkling water. Rich in vitamins, minerals,, and citric acid, ume-shu is also known for its health benefits. 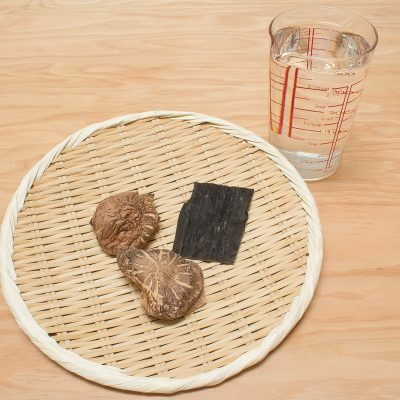 A small glass of ume-shu every day can help remove fatigue from your body and rejuvenate it. 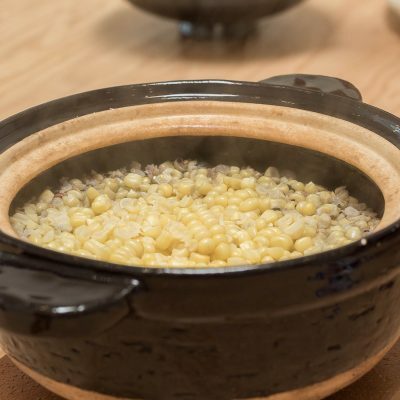 This dish is especially simple to make, as the ingredients are just corn, water, sea salt and kudzu (arrowroot starch). Really, that’s it, and every time I make this dish, everybody becomes crazy about it. The texture is nicely jiggly and the flavor is packed with rich natural flavors of fresh corn. Enjoy with a little bit of wasabi paste, if you like. In the photo below, I used sliced, blanched okra for decoration. This dish is such a nice summer treat. In the spring time, Japan is all about sakura (cherry blossoms). People go out to see the beautiful sakura trees in full bloom and also enjoy both sweet and savory treats using sakura flowers and leaves. With thin and tender yuba (tofu skins), this dish is full of spring flavors! The additional Mochi Mugi barley also adds the nice texture. 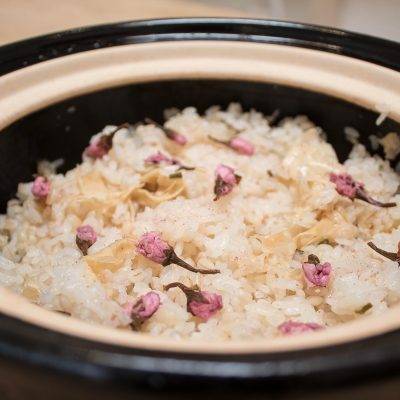 Salt-preserved (pickled) sakura can be found at some Japanese markets and online specialty stores. 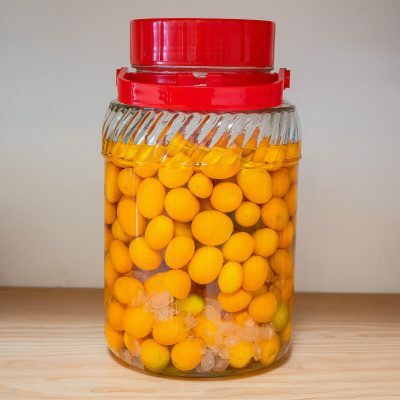 Bright and sweet-tangy ripe kumquat makes the beautiful liqueur in very easy steps. All you need is the patience, as once the ingredients are assembled, it takes several months for it to be ready to drink. Simplicity at its best, when a sweet potato is steam-roasted in Fukkura-san, the texture becomes rich and creamy, and the flavor becomes so sweet. 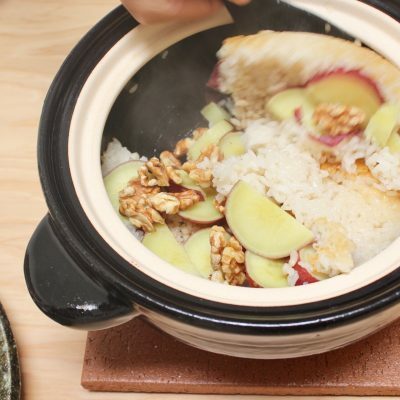 The glaze in the lid gives the effective FIR (Far-Infrared Rays…same effect as how a glowing charcoal heats to the core of ingredients) and moisture from the lid gives the perfect steam effect. 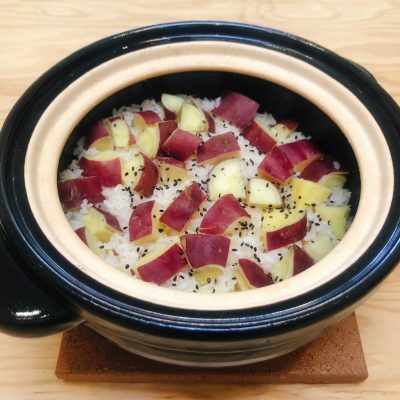 I used purple sweet potatoes in this recipe, but you can use Satsuma-Imo (Japanese sweet potato with pale color interior) or other types of sweet potatoes or yams. Serve with simple sea salt & butter, or Shio-koji Mascarpone Dipping Sauce, suggested in this recipe below. 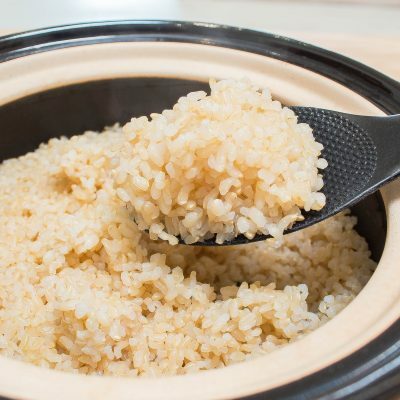 Mochi Mugi is a type of barley and it is considered to be a “super food”, as it contains much higher amount of fiber than brown rice or regular kinds of barley. For me, Mochi Mugi simply tastes so good and I really enjoy its nice bouncy texture. 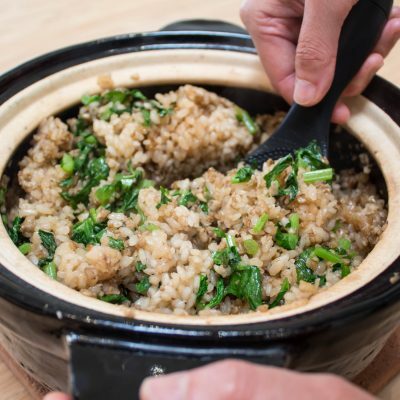 By adding a small amount of Mochi Mugi to your rice, your rice becomes not only more nutritious but it adds another nice dimension in the flavor. For each packet of Mochi Mugi, 1/2 cup (120 ml) water is needed to cook. Simplicity at its best, these salt-roasted fingerling potatoes always make my guests go crazy whenever I serve them at a dinner party. 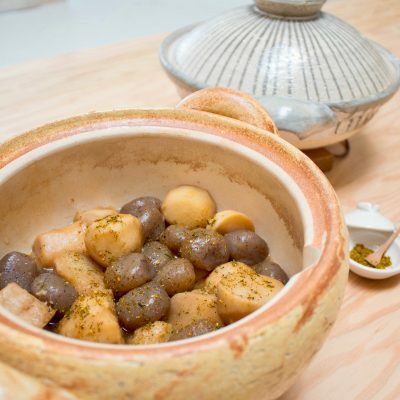 The potatoes are lightly salted and cooked in Fukkura-san over medium-high heat until done. 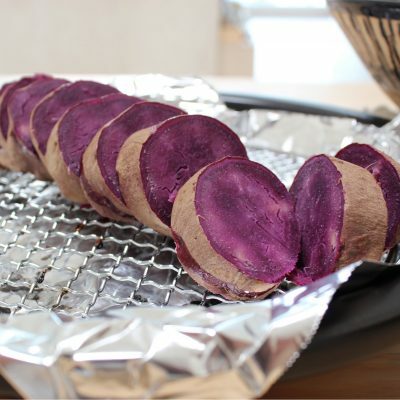 It gives both the roasting and steaming effects during the cooking, and the result is always the best roasted potatoes I’ve ever tasted! The skin gets delicately crispy and the interior becomes almost creamy. Just be careful with the heat, as the donabe gets extremely hot during cooking and even for a while after the heat is turned off. 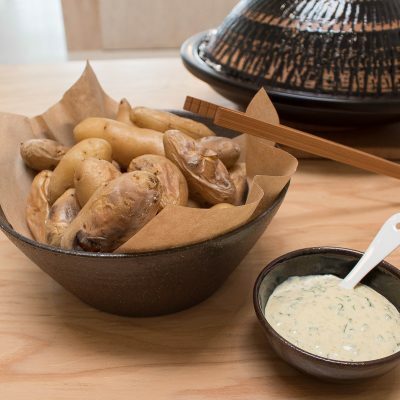 I love to serve it with simple Yuzu-Kosho Mayo Dipping Sauce which I can whip up in seconds.